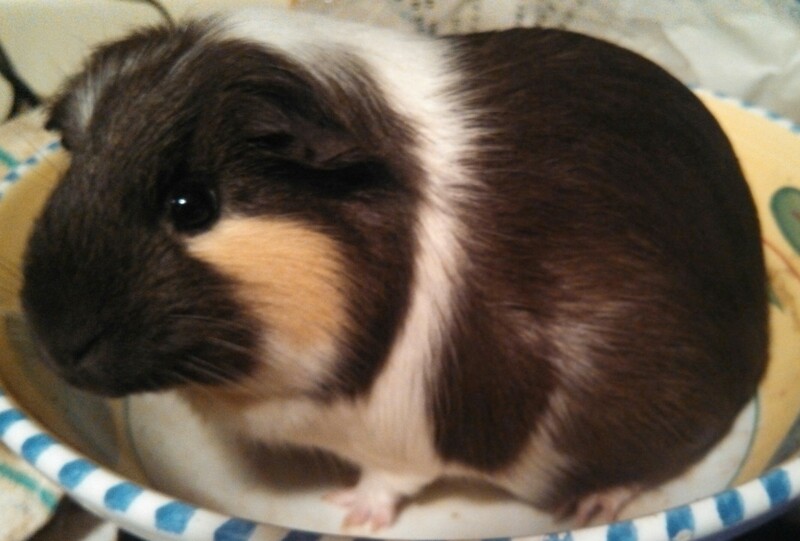 So, today I drove a total of three and a half hours to pick up three free guinea pigs… but it wasn’t just the Guinea Pigs… because that would be a large waste of gas, and I already have enough of them. 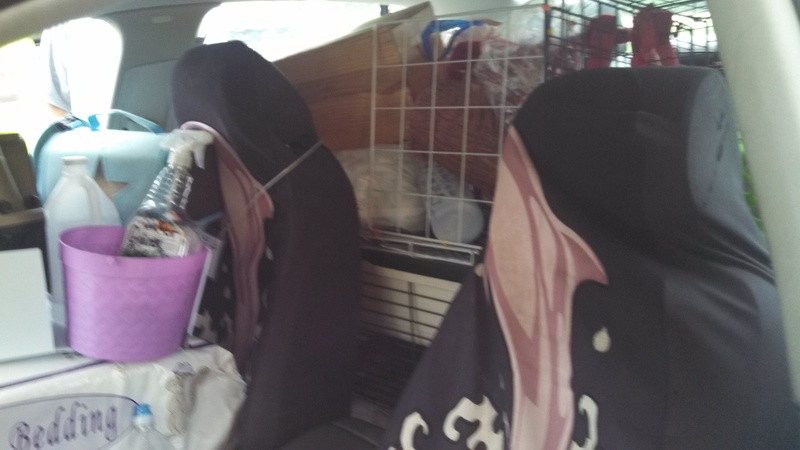 I literally packed my Jetta crammed full of guinea pig cages and materials. Front, back, and trunk! This includes materials for at least two C & C cages (the lovely indoor block structures), with three garbage bags full of fleece and absorbant towels that go into the cage (couldn’t fit the fancy cardboard that goes on the bottom), food, a food storage container, hay, an unopened bag of pine shaving, several toys, treats, and chewing toys, straw, igloos and hiding places, and three smaller wire cages, matching the ones that I already have. I am pretty sure there are some awesome things that I haven’t even found yet. 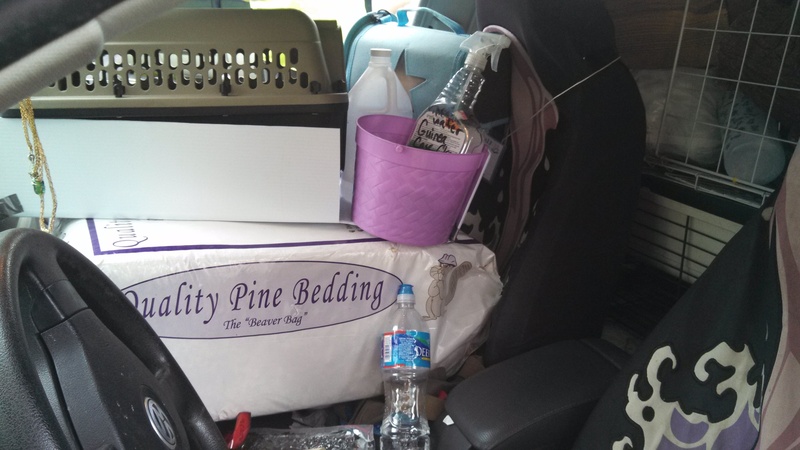 Backseat is crammed full as well… I really need a bigger car! I think I made out pretty well, paying only for the gas it cost for EVERYTHING! The women who gave up one of the females and one of the males was an amazing woman. I had a lot of fun talking to her, and she was only giving them up because she is ill (and the number of prescriptions on her kitchen counter did not lead me to question her). I grabbed another one from a home in Clayton. Two new females and a new male, and a car full of equipment. Cassius: She is a 1.5 year old female that I got from a house in Clayton with four children (they didn’t like her). She weighs 1.68 lbs. Her colors are actually much browner than she looks in the picture, and she is amazing pretty. This is Cassius (Cass), my new 1.68 lb girl. Cinna: Yea, totally inspired by Shakespeare, but I thought it was a better name for a girl that looks like cinnamon. She is 2.76 lbs, and was one of the two I drove to Farmville to get. She is 2.5 years old, and I probably won’t breed her. This is Cinna, a 2.76 lb female from Farmville. Brutus: This is my new male. 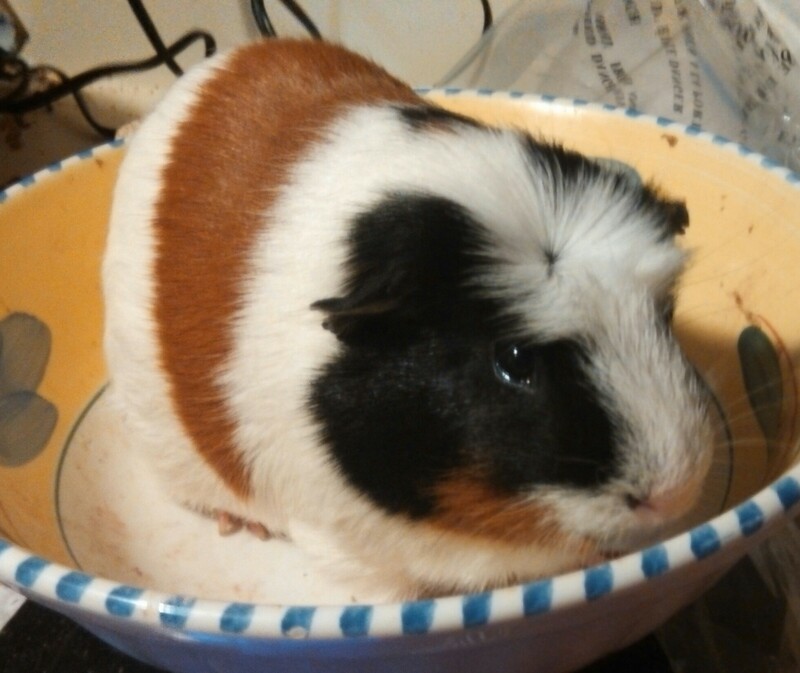 He is 2.05 lbs, and has an amazing rosette on his head, just like Steve-O does. He is 2.5 years old (or so). Right now, he is currently in a breeding cage with Cassius, the female I got in Clayton. 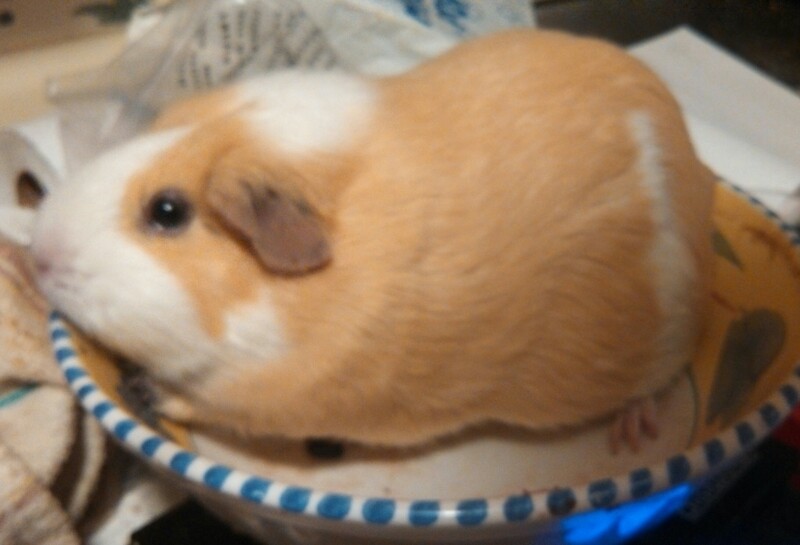 This is Brutus, a 2.05 lb male guinea pig from Farmville.